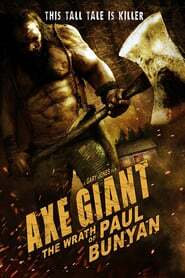 Axe Giant - The Wrath of Paul Bunyon is a dark, contemporary take on the tall tale. Kids at a first-time offenders' boot camp discover the legend of lumberjack Paul Bunyan is real, but is much more horrifying than they could have imagined. They incur the wrath of the 15-foot monstrous giant, who was banished from town 100 years ago and thought dead.